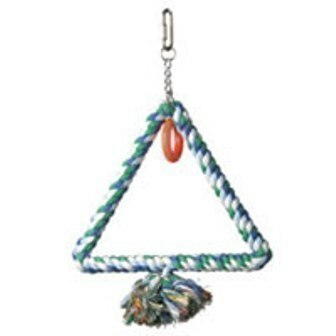 The Paradise Med Rope Simple Triangle provides a secure place for your bird to play, swing, relax or nap. The swing is made out of soft cotton rope which gives birds a strong grip and easily hangs from any cage. Colors will vary. Paradise Toys incorporates only the finest materials. Dimensions (LxWxH): 8.00 x 8.00 x 8.00 in. Notify me when Med Rope Simple Triangle-Caitec/Paradise is in stock.